My rig is a 4770k, HD7950 with 8GB of ram. So I saw a TON of videos and figured that I should be able to play 90%+ of games with 4x IR and AA? Even 2x AA? I get low FPS in some areas where I seemingly can't figure out the bottleneck. Nothing is pegged at 100% so I don't know what to turnup/down. All of my settings at the "defaults" i believe butg I can post them if necessary. Resolution is set to 1080p (not auto) and FPS is set to auto. Not sure if this effects anything. There were a couple of other instances. I started to do a mild OC on my Videocard to see if it would alleviate the problem somewhat and the most I gained was 1% on a lighting heavy level of SMG. Edit: 4x IR and 4x AA. Moving AA up/down seems to help but what I'm trying to understand is why I wouldn't be using 100% of my GPU? Should I go for a higher OC? I probably have the room. Also, should I assigned Dolphin to cores when I'm playing? My i7 has Hyperthreading turned on so maybe that woul dhelp? Because there are parts of your GPU that can't do certain things. Bandwidth and such can get maxed out without 100% of your GPU being used. (11-03-2014, 09:43 AM)JMC47 Wrote: Because there are parts of your GPU that can't do certain things. Bandwidth and such can get maxed out without 100% of your GPU being used. Ok, so a higher Memory OC then? I know I have room, I'm no where close to even a normal OC on these cards I think. I just want to know what I should be focusing on here. I hope a new card later down the line on Nvidia's GTX 970 (20nm) sucesssor will be far better witht he OGL support. Because Anti-Aliasing in Dolphin is extremely demanding, especially on AMD GPUs. You should never use it. Increase the internal resolution instead. It's less demanding and does a similar or even beter job at reducing aliasing artifacts. Instead of using 4xIR + 4xAA, use 6xIR with no AA (to do this, open gfx_opengl.ini or gfx_dx11.ini in notepad, search for the 'EFBScale = 7' entry and change it to '9') . Are you using Direct3D or OpenGL? Overclocking is not necessary. A much slower, old budget GPU such as the Radeon HD6850 can handle 6xIR. Overclocking the GPU memory past the rated frequency of the VRAM chips is a *bad* idea. It will always introduce some instability, artifacts, screen 'jumping', vertical stripes, driver resets, BSODs, instant reboots or lockups. And another thing you should know is each backend features a different type of AA: OpenGL has SSAA, while Direct3D has MSAA. Both are dog-slow on AMD GPUs. The inferior D3D MSAA is almost as slow as OGL SSAA (strange, but true). Yes, try turning off hyperthreading. It should be possible in the BIOS. Or you could set the cpu affinity of Dolphin to the physical cpu cores in the task manger. Hyperthreading is supposed to make stuff faster by adding more workload on your cpu cores, but it seems to not work right if the workload is only using 2 cores and not more, like Dolphin does. Also, the GPU doesn't really matter for the speed, it's the cpu. Overclock your cpu a little, and the performance in the game should rise by the same amount. Overclocking the system RAM might also help, but i'm not sure. I've underclocked my GPU once by 50%, and the GPU RAM by 50% as well, performance hit was around 3%. I don't remember if HLE audio is the default one in Dolphin, but I have to say that LLE audio in this game increases GPU usage by a lot (weird, yeah). 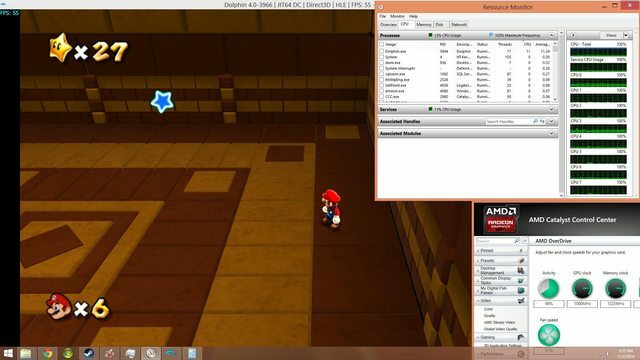 In the Mario face ship, I gained about 20fps after using HLE audio. About increasing the IR, I had thought about that but I hadn't wanted to add the changes in by hand. Seeing the changelog, I figured it'd only be a little bit anyway til it was added in the GUI. I'll try this out though. 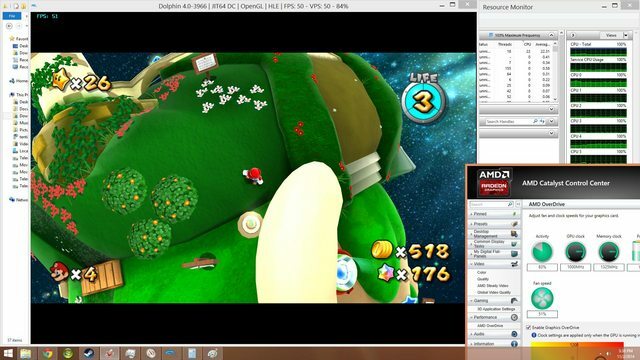 I didn't realize AA was so demanding in Dolphin, especially on AMD GPUs. I really don't want to turn off hyperthreading since I do like my multithreaded performance and it helps encoding performance which I do use. Setting the CPU Affinity of Dolphin to Physical CPU cores in Task Manager sounds good though. Any quick writeup on how I do that? I'll have to try OCing my CPU as well I guess. Hadn't ever planned on OCing it but well... I do have a 4770k so maybe it's about time lol. So is AntiAliasing performance with an Nvidia GPU better? I want GTX 970s/980s (or preferably the successor lol) that I am just thinking of reasons why it's good. Edit: I use the D3D backend since OGL is slower on AMD Gpus as stated. Another reason I am thinking of going green along with the larger user base. I just hate their business practice so much though and how they milk their customers. Edit2: What about AF? Normally this is an extremely low performance hit but how about on Dolphin Emu? So I tried the EFB Scale 9 (is this 6x IR right?) and turned off the AA and added Vsync (I was getting tearing before but with 6x IR it was even worse). With these settings I'm getting 60 FPS during gameplay and some small dips when navigating through the world map. Could probably reduce to a little bit to maintain a 60 constant FPS. Very very nice. Will have to test longer but it seems moving the IR up and reducing AA (Or just not ever having used that much/any AA in the first place) has significantly improved gameplay as I can now enable VSync and don't get massive tearing. Now I just need another Wiimote+Nunchuk for some 2 player action! @tential: It is a low performance hit on Dolphin too. 6xIR (EFBScale=9) looks so good at 1080p that you don't need AA at all. 3xIR may look very nice on a 21.5" 1080p PC monitor, but not so good on a 50" LCD TV. 4xIR improves things a bit, but it's still not enough. At 6xIR, the aliasing reduction is so effective that you can sit very close to a huge LCD display and still not notice any aliasing artifacts. The graphics are almost perfect. It's much better than using 8xMSAA (The D3D backend has no SSAA option). If you didn't know, it *is* possible to use SSAA with the Direct3D backend. by forcing the GPU driver to replace MSAA with SSAA through the AMD Catalyst Control Center. But the performane hit is huge. 6xIR is a much more effective solution.